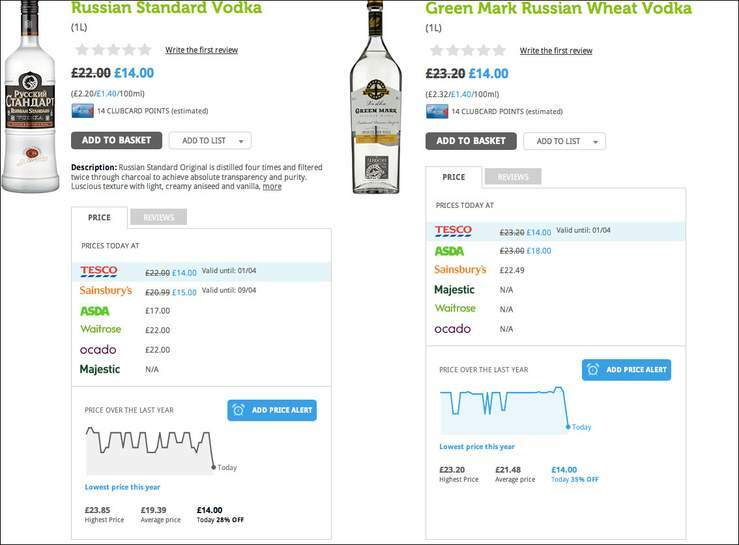 1 litre bottles of Russian Standard and Green Mark vodka are £14 from Monday at Tesco. Really good price for, in my humble opinion, the best vodkas in this price range. To get anything better you would be looking at Belvedere, Zubrowka etc. This site really seems to be going to the dogs lately!! Great price dude thanks, we got this at Xmas, great vodka for £14! whats better smirnoff, RS or GM??? I would say Green Mark > RS, although they are very close, and then a distant 3rd would be Smirnoff. I like green mark ..well worth this price ..
Green mark is a decent one, good price - hot! I think Green Mark is far better than Russian Standard. Though I have thought the quality has varied with some bottles better than others. The top on the GM is very annoying, I doubt it takes my bottle top optics looking at the diameter. 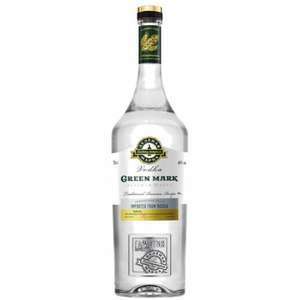 I am Russian, an Russian standard is one the worst vodkas I've tried, or … I am Russian, an Russian standard is one the worst vodkas I've tried, or as one would say, way below Russian standard vodka lolGreen mark is a decent one, good price - hot! Thanks OP, I need to stock up on Green Mark. Wish I saw this this afternoon. Just had to pay £13 for 70cl from my local shop. Stocking up on RS tomorrow tho, also its far the best vodka. Far far better than smirnoff and GM I drink a bottle of that and was sober still. Also very little in hangover on RS. If I could give this post 100% I would. How is that Sainsbury's fault? Lol divid1 so you rate vodka by how drunk it gets you and how a bad a hangover it gives you? Must be an expert! I'm not Russian but I second this, Russian Standard is bottom of the barrel Vodka, sold purely on the name alone. Lived in Russia for a couple of years, tried a lot of vodkas and consider both GM and RS pretty good. Also, the price of RS is higher than GM in most/all russian stores. I second the hangover comment on RS. I did try GM recently and do like it. Ordered 3 bottles Green Mark & 2 bottles RS, went through Topcashback for £5 off, used XXJMJM ecoupon for £12 off a £60 spend + £3.50 delivery, works out £12.30 bottle or £11.30 if TCB tracks & pays. What vodka would you recommend? Ordered 3 bottles Green Mark & 2 bottles RS, went through Topcashback for … Ordered 3 bottles Green Mark & 2 bottles RS, went through Topcashback for £5 off, used XXJMJM ecoupon for £12 off a £60 spend + £3.50 delivery, works out £12.30 bottle or £11.30 if TCB tracks & pays.Thanks for posting. Heh. I went for 4 bottles of GM + 2 tubs of finest ice cream to bring it up to £60, so could use £12 and £2 off vouchers. Delivery was £3 so ended up paying £12ish a bottle. Hahaha, ice cream vodka cocktails......I need to try that. Smirnoff? I demand to see your passport! 1 ltr Bottles Bacardi Oakheart for £14 is an excellent price at Tesco as well. I posted the Tesco £14 deals with the online discounts etc. and its -60 cold last time I looked....hahahaha, crazy. Smirnoff tastes way better than Russian standard IMO Depends which way you drink it, straight Smirnoff goes really well. You can't question me, I have had so many different vodkas you have to be Russian to judge me. lol, are you for real? In the future then i will only take the advice of a Scotsman when a deal is posted for whisky. lol, are you for real? In the future then i will only take the advice of … lol, are you for real? In the future then i will only take the advice of a Scotsman when a deal is posted for whisky. Try the Irish Poteen my friend, then you will find out who the real puss**s are. Very good price for Russian Standard. I personally prefer it to Green Mark. £14 is still great for GM though, both being far superior to Smirnoff / own brand.